Yes, I teach cycle. I’ve either taught or taken class since 2002. 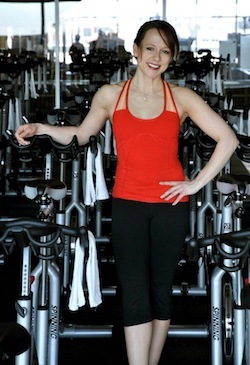 Flywheel is not just cycle. It’s not spinning. It’s not a light sweat. It’s a whole other breed of fitness. 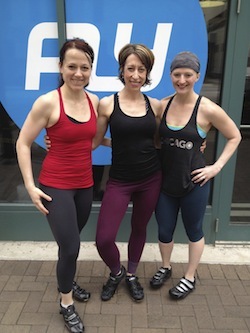 When Flywheel first came to Chicago, it was ALL that rage. The Biggest Loser’s Jillian Michaels came to town and taught a private class to a room full of lucky, or should I say, “lucky” particpants. And today? Flywheel continues to push people’s limits with your own personal torque and RPM monitor, and a leaderboard where your energy output is posted for all to see. This level of competition can provide fruitful when you need it most. Now, technically this was not my first time at Flywheel. However, this was my first time taking class with the ever-energetic Donna Cennamano. Upon meeting her, my initial reaction was that she looked innocent. This of course worried me. This “nice” demeanor was quickly dissolved when her 45-minute class left me sore for four days. Did I say I teach cycle? What I liked about Donna’s class was that even though it was super tough, I knew I could push through it and it would be worth it. It was easy to follow her instructions and every drill was jam-packed with intensity. Her playlist also included a hot Avicii remix which left me amping it up more than I thought I could. About three-fourths the way through class we stopped for an upper body strength break. Each bike is equipped with two fairly light weight body bars that are about a foot long each. But no matter how light weight they seemed at first, by the end my arms were pleading with me to make it stop! After arms, we forged back into riding and then ended the class with an all out push. I highly enjoyed Donna’s class and am eager to come back and fly again!